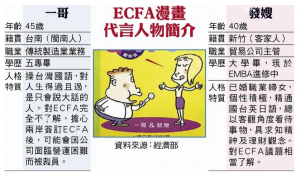 Taiwan's Ministry of Economic Affairs published a booklet featuring two cartoon characters to inform the public about the proposed free trade agreement between Taiwan and China, commonly referred to as ECFA. The cartoons quickly attracted criticism as they were considered derogatory to certain ethnic groups. The cartoons depicted two characters, Yi-ge, a Hoklo-speaking salesman from Tainan and Fa Sao, a Hakka woman from Hsinchu who speaks English, Mandarin, Hoklo and Japanese. 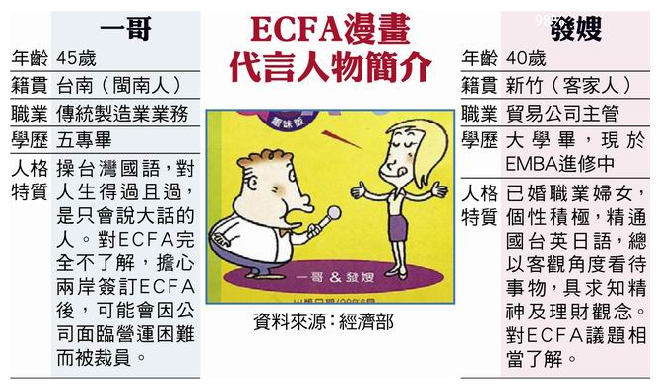 Yi-ge is depicted as poorly informed about ECFA while Fa Sao is shown as someone who seeks knowledge and is well informed about ECFA. Echo Taiwan posted a picture of part of the cartoon which described in detail the backgrounds of the two characters. Echo looks at the political reasons why Tainan was represented in this way in the cartoon. Why must they choose a person from Tainan? Tainan is the hometown of former President Chen Shui-bian. Tainan City and County are the places where the pan-green parties have never experienced a major electoral loss. You can say Tainan is the important town for pan-green supporters. Connecting Tainan people with the negative description of personality traits firstly makes the reader unconsciously take in a hidden meaning of a “pan-green = low class” caricature. Such strategy also ridicules A-Bian and his supporters without spelling it out explicitly. The View from Taiwan featured a guest post by Drew Kerslake which analysed the cartoons in terms of their context in contemporary Chinese nationalism. Kerslake argues that both PRC and ROC nationalist ideologies are based on the late 19th century concept of racialism. He goes on to look at how this ideology is reflected in the cartoon characters and the relationship between the coloniser and colonised. In the case of the cartoon images we see a clear example of Hoklo and Hakka as “ethnic other/periphery”, with the KMT and its representatives firmly in place as the “civilized center” or as “advanced” on a constructed trajectory using the dichotomies of forwardness and backwardness/ advancement and degradation/modern and backward/ civilized and uncivilized . Kerslake goes on to write that the cartoons are actually discriminatory to both Hakka and Hoklo speaking people in Taiwan. The Far-Eastern Sweet Potato writes that the production of the cartoon wasn't a mistake and someone high up should take responsibility. Deng can say all he wants about the ministry not wanting to insult anyone, but the fact of the matter is, surely, at one point in the process of creating the cartoon, someone in the army of “public relations experts” that came up with this brilliant idea would have noticed that by design or accident, the depictions were prejudicial, if not outright racist. Surely, someone would have raised an objection, or called for caution. If this happened, then that person was silenced, as often happens in government. If no one did, then it means that whoever was involved in the creative process all agreed on what can only be seen as defining characteristics based on biology, which is the first step toward outright racial discrimination. Letters from Taiwan criticises the apology of Minister of Economic Affairs Yiin Chii-ming (尹啟銘). Yiin thinks that being born in a place precludes you from ever doing anything that might upset other people from that same place. I can not agree with this premise. Second, Yiin makes a surly, underhand, illdefined attack against ‘people’ who harbour ulterior motives. This comment is a clever way to imply that those who are upset about the cartoons all have ulterior motives (subtext message: if you don't want to be regarded as one of those people, you shouldn't feel so bad about the cartoons). By claiming that it is these ‘people’ who are turning the matter into an ‘ethnic issue’, Yiin not so cleverly hopes that it will distract the public from the origin of the ethnically insulting cartoons themselves eg the Government. Funny reading this stuff now, considering the fact that Taiwanese in general are extremely prejudiced against “Mainlanders”. If anything the whole concept of BSR/WSR is racist, but it was used to fuel the Taiwan independence movement so barely anyone complained. it’s hilarious to say that discrimination against hakka and tainan, if any, is related to racism. so everything can become a racist problem when Newyorkers discriminate against Texans, or Parisians against Londoners. I think the important issue here is that, structurally, the KMT (ROC) has positioned itself i.e. KMT ideology, along a constructed trajectory as “advanced/modern”. Of course this is purely subjective based only on the values the KMT wishes to promote. The greater problem lies in the fact that the KMT is continuing to use state power to conduct a project which seeks to transform those who it feels are “backward”. The “New Yorker” analogy would only be relevant if the United States government identified New Yorkers as “better” and Texans as “lacking”, then deployed its resources to promote New York values over Texan values in an attempt to get Texans to become more like New Yorkers. As long as the government continues to play an active role in developing/promoting/defining “culture”, there will continue to be ethnic conflict in Taiwan. It is still a colonial project. On the perceived Taiwanese animosity toward “Mainlanders”, it is important to note that when the KMT arrived on Taiwan the Nationalists introduced a new state structure in which ethnicity played a role in determining one’s economic and social mobility. Taiwanese were often viewed as being “tainted” by Japanese rule and thus could not be trusted and therefore the KMT chose people who it could count on as being loyal. The KMT and CCP both constructed ideologies that viewed a strong central state as essential to create a strong nation, as the Qing empire was a vast plurality with no monolithic culture or single spoken language. The early Republicans sought to transform the pluralities under the Qing into a single, loyal citizenry of a modern nation state. This project was essentially written into the constitutions of both the CCP and KMT. This belief and conviction that plurality had been the downfall of the Qing, led the KMT to enforce its cultural program at the expense of other cultures. What the two cartoon characters readily identify is that the government of Taiwan is still engaged in a civilizing project aimed against citizens it feels are lacking and in need of the strong authority of the KMT to transform them into “better” and possibly more “loyal” citizens. This is like saying that the raising of Joe the Plumber and Sarah Palin to national prominence in the 2008 U.S. Presidential Election indicates the GOP’s racist depictions of Americans as poorly informed, with Palin represented white ethnic Alaskans and Joe representing white ethnic Ohioans. Ohio was politically important for the GOP, for obvious reasons. And Palin was a fetishized object of desire, for some. You erect another “straw man”. Why not address the issue head on. I’ve seen you do this before elsewhere. What straw man are you talking about? Please explain. Is this cartoon racist? My short answer would be “no”. It is not “racist”. 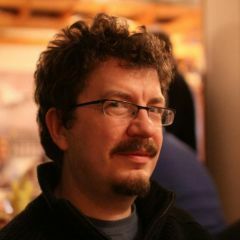 Kerslake’s post gives his explanation of why he thinks “racist” is not the right word. I agree. I don’t think it is a “racist” cartoon. “Offensive”, “objectionable”, “belittling”, “stereotyping”, and “ineffective” would all be appropriate terms to describe the cartoon; “racist” is not. Throwing the word “racist” out there tends to add fuel to a fire of any discussion. I think it invites attention of the wrong kind. It tends to cause people to divide into opposite sides of racial camps, making it harder to reach understanding in any discussion. 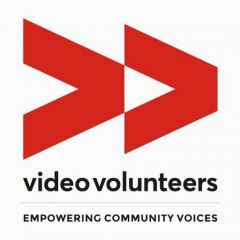 “Global voices online” is about reporting on different voices in the global media that are often not well reported. Using inappropriate and provocative language is not the right way to do it. The rest of Reid’s blog post is actually not bad – the author does not use the word “racist” to describe the cartoon in the body of the post, and he cites the various sources in a fair manner. This leads me to suspect that it was an editorial decision to title it this way – in which case, thumbs down for that. In my first posted comment above, I used an analogy to American politics to show that a similar use of the term “racist” to describe the GOP’s strategy to elevate Joe the Plumber to the national stage would be thought of as absurd. I think it is just as absurd to call this cartoon “racist”. Just to clarify the title of the article was chosen by me. Although the post is submitted to an editor for approval, the editor obviously did not see any need to change it. The purpose of the article is to present the opinions of different bloggers about this issue and not my own opinion. I have my own personal blog and if I wanted to express my personal opinion about this issue I would have written something there. I believe the use of the word racist to describe the cartoon in the title is justified. The cartoon clearly discriminates against certain ethnic groups in Taiwan and portrays them in a derogatory and stereotyped fashion. 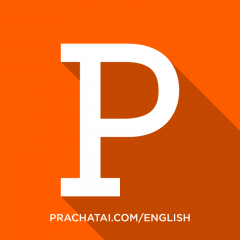 How are your examples analogous to any part of the contributions above? You have dismissed an argument but it is not clear what you are dismissing. You’re entitled to your opinion, but I respectfully beg to differ on the use of the word “racist” to describe the cartoon. Using “race” in this context as the concept to differentiate between people of “hoklo” ancestry (also sometimes called “minnan” (south of the river min) and outside of Taiwan, “hokkien” (i.e., from “Fujian” in the southern Fujianese dialect) or even “lannang” (I’m not sure of the origin of this term – perhaps you can enlighten me) and sometimes just referred to as “Taiwanese” although that is probably inaccurate) and “hakka” ancestry (also pronounced as “kejia” in the Mandarin dialect meaning “guest families” referring to their migration as refugees from northern China). “Race” is one of those malleable concepts, so it may be a pointless exercise to debate to “correct” meaning of “race”. But I do think there is a general usage and undertanding that differs from how you are using it here. By calling the cartoon “racist” you are implying that people of hoklo and hakka ancestry are different “races” (at least that’s how it sounds to me – please explain if one can read it differently) from one another, and different from whatever race it is you think the KMT represents. This is strikingly different from how people generally understand “race” when applied to persons of hoklo and hakka ancestry or the KMT leadership. People generally do not regard them as belonging to different races; rather, they are usually regarded as different regional or dialect groupings within the same race. Any perceived differences or conflicts between them would at most be referred to as “regional” differences. 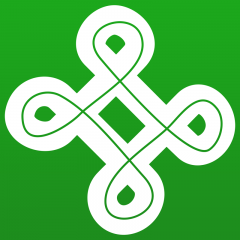 I might grant you the use of the word “ethnic” difference in this context – you can make a stronger argument that the hoklo – hakka difference is an “ethnic” one because they may have somewhat different dialects and cultural traditions (e.g., cuisine, marriage rituals) and perceived ‘qualities’ (e.g., thrift vs extravagance) but these are somewhat difficult to pin down with any specificity because even within hoklo and hakka families, there may be variations depending on the particular county or village. But even there, I would tend not to use the word “ethnic” to describe the differences between hoklo and hakka, although I can be persuaded otherwise as there are many instances where this is used. That being the case, we (Americans of the United States variety) generally do not describe the differences between, say, white Minnesotans (many of whom have Scandinavian backgrounds) and white West Virginians (many of whom have Scotch-Irish backgrounds) as “racial” differences. We tend to think of them as belonging to the same race, but at most, there may be ethnic or regional or linguistic or religious differences that have progressively faded over time in the melting pot and today you’d have to look hard to identify any ethnic differentiation. (It’s always fun to watch old movies like “Shane” or “It’s a Wonderful Life” to reflect on how certain white European immigrants were depicted to get a flavor of the assimilation process over time). That’s why I think it would be absurd to refer to Joe the Plumber (from Ohio) and Sarah Palin (Alaska) as belonging to different races, and any cultural differences one might perceive between them as “racial”; and that the GOP’s elevation of these ridiculous but colorful characters to the national stage demonstrates the the GOP’s racist and discriminatory agenda. Surprising as it might be, there are lots of Americans (mostly white) who went for this. If I were a white blue collar worker, or a white career woman, I might get offended by the GOP’s use of these characters as symbols of their supporters, but I wouldn’t call their use “racist”. I don’t think that in general, people in Taiwan (or anywhere in China) or anywhere among the Chinese diaspora around the world, think of the differences between hoklo and hakka (or for that matter, cantonese, hunanese, shanghainese, szechuanese (sichuanese) etc. as “racial” differences. When shanghainese make jokes about beijingese and vice versa, or when people of hoklo background have anxiety marrying into a hakka family and vice versa, these are generally thought of as regional differences and prejudices, not “racial” prejudice and discrimination. Getting back to the political use by the KMT of cultural stereotypes (which appears to have backfired), we can all agree that acknowledgment or exploitation of racial/ethnic differences is a strategy used by politicians everywhere as a means of getting support. It could be done by attacking an ethnic group (to get support from those not attacked) or by showing that members of a particular ethnic group support the politician’s aims or candidacy. The KMT’s use of the cartoon was apparently intended to have an “outreach” effect on certain ethnic constituencies, but in doing so, may have relied on stereotypes that the targets of the effort found demeaning. An analogy might be to the GOP’s use of “tito the builder” which some latinos found offensive and hypocritical given the generally anti-immigrant policies of many republicans. I think you might even be able to call that “racist” but again only because in the U.S. we have a history of whites vs. colored peoples (although some might argue that even there tito the builder, a columbian immigrant, is “white” so it would not be correct to call the stereotyping “racist” but rather “ethnic”. Just because something is presented in a stereotypical way against certain ethnic groups does not make it “racist” when the stereotyping happens within members of the same “race”. This is not “racism”, it is “ethnic conflict”, “ethnic stereotyping”, “ethnic prejudice”. A perfectly correct title would be “ethnically demeaning cartoon causes controversy”. You are entitled to your own opinion, and I respect that, but I also think your use of the word is wrong in this context. If your intention is to merely report on the controversy (which you have ably done in the body of the post), then I think your use of “racist” in the title needlessly mars the rest of the post.